Hey Everybody! I hope your Christmas was bliss! :D This is the last of what is in my makeup room (that I never reviewed)! Unfortunately, most of these products are no longer offered for sale. I plan on working on my makeup room video in January. So it should be up by the end of January. I'll have my Best of a Very Sweet Blog 2017 (last post) up before the end of the year. MAC Charlotte Olympia was released in early 2016. I love a good red lipstick. Three shades were offered and I purchased all three. I really love all of them and just like MAC, the quality is really good. These are no longer offered, except on maybe eBay. These were a hidden gem in the beauty community. Sephora's Luster Matte Long Wear Lip Colors were creamy, felt great to the lips and pigmented. The price point was $16. I really liked all three colors on me. Only 4 colors are currently offered on their site now $5. They seem to be discontinued. Out of the colors I have, Petal is still being offered. You may remember my review of Stila's Stay All Day liquid lipsticks. Well these were the vinyl lip glosses. They are no longer offered. I love the color, but these have a lot of stick and HIGH SHINE. So I don't know if they will be staying in my collection. I'll give them more of a whirl in the new year. Milani makes EXCELLENT lipsticks! But if you love a color, you better get it. You better get two! They change colors faster than you can blink your eye. HaHaHa None of these are offered anymore. Jo has been a long reader and blog friend of mine. She sent me this beautiful Jill Stuart Collection for my birthday. Jill Stuart Beauty is hard to obtain in the States. It's mainly sold in Japan and other Asian countries. I love the colors in this collection. I've also reviewed My Dear Strawberry Collection in the past and Concealer. The quality is always excellent and packaging is always pretty. Thanks Jo! 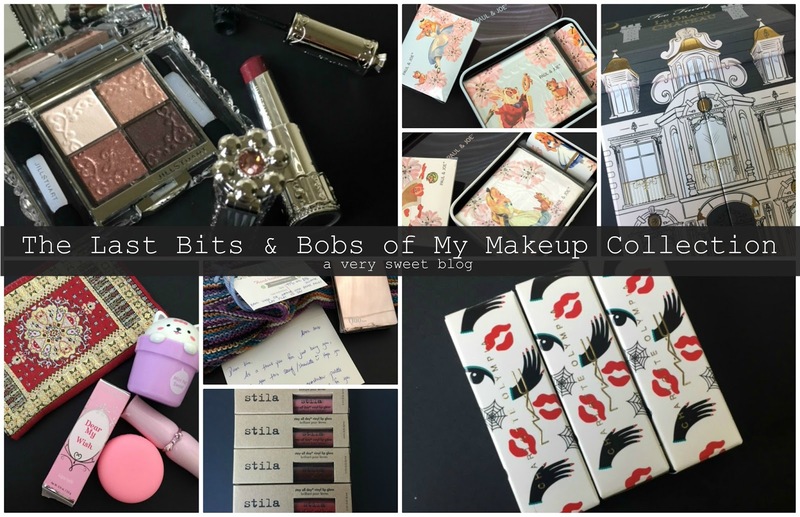 Desle of Diva Desle Blog loves makeup as much as I do! HaHaHa We hit it off as blog buddies right away, with my love for Too Faced. I think it was last year, she sent me this package after going to Doha, Qatar. I can't believe I forgot to take a picture of the shawl! It is so pretty! But she also sent me a beautiful makeup pouch (Qatar), hand cream, lip balm and this beautiful lipstick. This Dear My Wish Lipstick is bomb! It feels so good to the lips! I need to get it in more colors. LOL Thanks Desle! I love Emmy! We've been blog buddies for years. So down to earth. Can sew anything. Fantastic with family. I always enjoy her adventures. She sent me a package in 2016. It contained a beautiful handmade shawl, note and QUO (Canadian Brand Eyeshadow) Palette. I loved everything Emmy! I've never tried the brand QUO! Do you see the pigmentation of these eyeshadows? AMAZING!!! In 2015, Little Luxury List sent me some Asian Snacks (Asian Snacks Part Two). She's also sent me Stila makeup and delights from Fresh Beauty. Well, I never reviewed the hand creams. First, they are adorable. They're like little doll houses. Each has a soft scent. They're really creamy and are REALLY GOOD hand creams. I purchased a lot of Kylie lipsticks last year, but I barely purchased anything from her his year. Nothing really impressed me. I purchased her Kylighters for half price and they were horrible. LOL She came out with a Valentine's Day collection. I purchased two kits, Sweetheart and Kiss Me. These were really good. You got a dual eyeshadow, liquid lipstick and a gloss with these. I love these two. There was a third one (you can get all of these on the eBay black market), but the colors didn't appeal to me. I didn't review these, because by the time I got them Valentine's was over. LMAO. I didn't purchase this in 2015. I purchased the Too Faced Grand Hotel Cafe in 2016. But I always had buyers remorse (makeup collector), for not purchasing Le Grand Chateau! So I purchased this from a seller on eBay. If you buy this now, it is EXPENSIVE. I love the house (mansion) and all the little makeup books. My favorite is the pink & green one. I was sad to see that Too Faced didn't come out with more of these Christmas mansions. The packaging was so detailed & beautiful. They came out with planners, which I didn't buy. But these were little treasures. I love DHC Cleansing Oil! Remember the DHC Alice in Wonderland Cleansing Oil Collection I purchased? Well, I wanted to try their lip balms. They came out with these cute princess ones. I never used them. Well I just tried them and they are absolutely amazing. They really moisturize your lips. I started blogging in 2010-11 (can you believe the focus was fashion topics? LOL). There was a MASSIVE Alice in Wonderland craze going on (Tim Burton's Alice in Wonderland) during that time. It's one of my favorite fairytales! I've always believed in dreaming and wishes coming true. Well I missed this collection. I found it on the black market soon after and purchased both kits. I really love everything about it, but especially the Alice lipstick cases. So this was added to my collection. It's been a great year of reviews from you, Kim, and I've had so much pleasure following along. I can't wait to see your make-up room in 2018, I know it's going to be beautiful. Wishing you all the best for the coming year! Hope you had a lovely Christmas as well, my dear Kim:) And so glad to hear you loved the shawl and Quo. It's one of the few Canadian brands I really love. Those Charlotte Olympia lippies look so fab on you, and I also agree that Milani have the best lippies. Comparable to MAC IMO. My everyday lippie is a Milani one (although having a brain fart at the moment so can't remember the name:P). What beautiful pieces! I absolutely love the packaging design of Jill Stuart products, they're so pretty and detailed! I just wish they were available in the US. The Paul & Joe kits are really cute too, that's great that you were able to find them even though you missed out initially. I hope you had a wonderful Christmas and best wishes for the new year! Most of the products that you have presented in this selection have been to my liking, the lipsticks of Kylie, MAC and Sephora are my favorites and the eye shadows of Too Faced Le Gand Chateau fascinated me, happy holidyas Kim!